By pulling ingredients like Unicorn Tears and Fairy Dandruff, represented by marbles, out of the potion dispenser, the higher up ingredients slide down to fill in the gap. 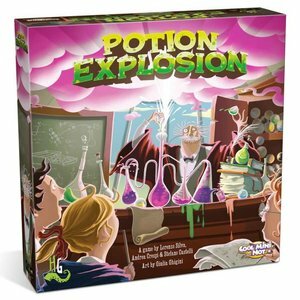 Players try to make the same ingredients smash together causing explosions and big turn combinations. Once all the necessary ingredients have been collected, players complete the potion for points and special abilities. The player with the most points graduates head of the class!